Lightning fast storage for your creative workflow. The Drobo 5D3 is the 3rd generation 5 Bay Direct Attached Storage reimagined for media professionals, content creators, and small businesses. Lightning fast Thunderbolt technology delivers the speed, and Drobo's fully automated Beyond RAID functionality provides the simplicity for the best storage experience on the planet. Not only is the 5D3 fast, but it's easy to use, expandable, flexible and protected – exactly what you would expect from a Drobo. Safely edit, store and view photos and videos for your 4K/5K workflows as well as back up your personal and business data. This latest generation offers high-performance connectivity and is backward compatible with any computer running supported Mac OS X or Windows. Drobo 5D3 comes with an Accelerator Bay for an mSATA card (not included) to enable our patented Drobo Accelerator Cache technology. The Drobo Accelerator Cache keeps a copy of your most frequently accessed data so that it can be delivered even faster when you need it. 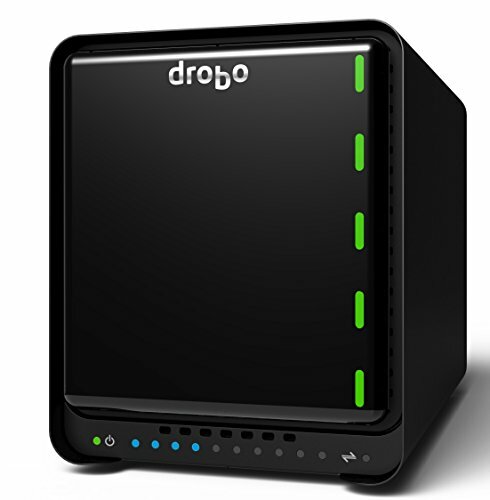 Drobo 5D3 includes a battery that protects all data in memory, or cache. During a sudden power loss, the battery keeps the Drobo alive long enough for the data to be written to non-volatile storage, ensuring your important information is safe. Drobo LEDs can also be dimmed to reduce light pollution in photo and video editing environments.